But “deplorable” Americans threw a wrench into their scheme by electing Donald Trump as President in 2016, and President Trump’s standing up for America’s national interests now has globalists in a panic. Now, a prominent globalist activist, Irish rock star and U2 lead vocalist Bono (real name Paul Hewson), is sounding the alarm that the very existence of international bodies such as the United Nations (UN), European Union (EU), North Atlantic Treaty Organization (NATO) and World Trade Organization (WTO) is in peril. Edith Lederer reports for the Associated Press that during an event on July 2, 2018, to launch Ireland’s candidacy for a seat on the UN’s powerful Security Council, Bono delivered a “sobering” speech to several hundred U.N. diplomats and staff, warning that the United Nations and other international institutions including the European Union and NATO are under threat, and urged nations to work together to ensure their continued existence. While Bono didn’t name any countries responsible for threatening global institutions during these “troubled times,” his words appeared clearly aimed at U.S. President Donald Trump, who has criticized the EU and NATO. Bono cited Trump’s pulling the U.S. out of the Paris climate agreement, and taking aim at the World Trade Organization with new U.S. tariffs. You should know that this is the same Bono, 58, who is widely praised and lauded and given awards as a philanthropist, but whose anti-poverty ONE foundation gave only 1.2% of its funds to charity. The Daily Mail reports on Sept. 23, 2010, that the non-profit ONE organization, co-founded by spokesman Bono in 2004, received almost £9.6 million ($12.58 million) in donations in 2008 but handed out only 1.2% of the donations (£118,000 or $154,620) to charity causes. Instead, ONE spent more than 51% of it donations (£5.1 million or $6.68 million) on salaries to its staff of 120. ONE also funded high-profile, celebrity-supported events “to fight poverty in Africa and AIDS worldwide”. ONE said it took no money from the public and that most of its funding came from the Bill & Melinda Gates Foundation. Over the years, it has often been shown that what Bono says and what he does are two different things. In 2007, U2 moved part of its multi-million dollar song catalogue from Ireland to Amsterdam just as their homeland ended a tax exemption on music royalties, to take advantage of the Netherlands’ low to non-existent tax rates for musicians. Fine — except in the ensuing years Bono (and his charity One) earned kudos for insisting countries, corporations and people pay taxes in pursuit of a fairer society. 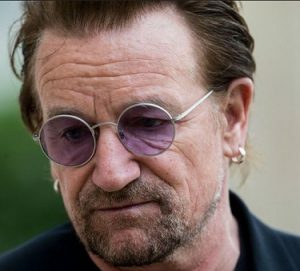 In 2011, Bono, 57, who, according to CNN has an estimated net worth of $590 million, further angered his countrymen when he espoused the values of Ireland’s 12.5 percent corporate tax breaks. He went on the record to claim that these breaks for multi-billion dollar companies had brought Ireland the “only prosperity we’ve ever known.” He had a point, but as the locals noted, Bono wasn’t even giving the country a meager 12.5 percent any longer. In defending his tax position, Bono told Sky News that just because he had campaigned for a fairer society did not mean he had to be “stupid” in business. So, last week, when it was revealed in a trove of leaked documents that Bono himself was a partner in one of these shady companies, the hypocrisy stank. The so-called “Paradise Papers,” which belonged to an offshore tax haven, showed that Bono had formed a company with two Irish businessmen based in the low-tax island of Malta and bought part of a shopping mall in Lithuania, thus eluding the international taxmen…. Meanwhile, Bono repeatedly falls back on the work of One and his messianic campaign to save Africa as his failsafe excuse for any perceived bad behavior…. [But a] person who worked closely with One for years and has intimate knowledge of the organization told me that the charity is “strictly an advocacy group which tries to influence or shame African governments into behaving” and that not one dollar donated to One goes to real “boots on the ground” help…. All the while, he [Bono] is rewarded by a sycophantic media honoring his every utterance with a magazine cover or an accolade. God bless our President Donald John Trump! This entry was posted in Donald Trump, EU/Eurozone, globalism, Liberals/Democrats/Left, United Nations, United States, US Presidents and tagged Bono, Bono's real name, Bono's shell company. Bookmark the permalink.